Tennis is all about footwork. If you don't move right, you won't hit the ball well either. Getting to the ball on time and having the right position for a stroke is the most crucial and most difficult thing in tennis. Surprisingly, many tennis coaches do not educate their players and do no pay enough attention to the correct movement during their lessons. 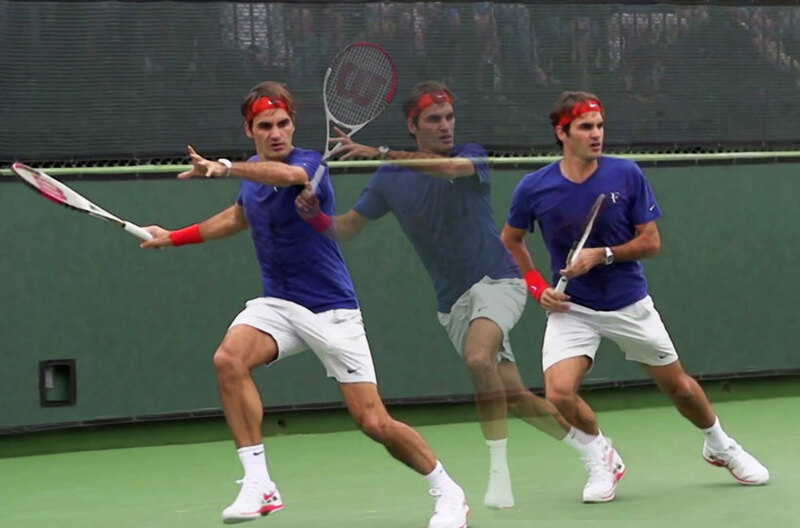 In this article we would like to explain the basic principles of footwork and movement on a tennis court. There are four different types of leg movement you can use during a game of tennis - a basic frontside running, backwards running, sideways running and sideways cross over. Lets explain each. You use frontside running for most of the short balls. There is not much science to this. You see a short ball and you run for it. Try to use short steps, especially the first couple of steps. This way you gain speed faster – look at 100m sprinters how they start the race. When you get to the short ball try to hit the ball from a sideways position. It is always easier to hit a short and low ball from a sideways stance. After you hit a shorter ball and you decide not to attack the net you need to return as fast as possible to the centre of the court behind the base line. While returning to your centre position you have to be facing your opponent. Never lose the ball and your opponent from sight while you are returning to the centre! Use backward running when you had a short ball and you need to get back to baseline. Use sideways cross over steps when you need to run to the side of the court to hit a ball. This is where it all gets interesting and where most players get it wrong. From a neutral stance a sideways cross over step is always the best and the fastest option to use to get to a wide ball. This means that for a right handed person that goes for a forehand stroke the first step from a neutral position should be a cross over step with the left foot over the right! This way a player can already start preparing for the swing and can keep running towards the ball in the fastest way. Many amateur players still use as a first step the foot that is closest to the direction of running which allows them a step of 20 or 30 cm. On the contrary if you make a first step with the foot that is farthest from the direction where you want to run and your first step is a cross over step, you can make a step of 1m. This saves times and closes the distance to the ball in a more efficient way. Sideaways movement is a recovery movement. You use it just like the backwards running when you try to get to the centre of the court after your stroke. The idea is that you are always facing your opponent and you are ready to change direction depending on your opponent stroke. To summarize the tennis footwork – you use cross over steps to get to the ball and sideways steps to get back to the centre. As simple as that. For more of our tennis tips either sign up for a tennis holiday with us, sign up to our newsletter or read some more of the articles in our online tips section. Thanks and keep grinding on the tennis court with some tiger style movement.